For twenty-seven years, Tim Hoppey watched the world with writer’s eyes from beneath the rim of a fire helmet. 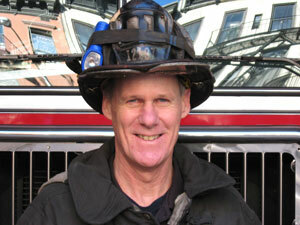 Before retiring in January 2012, he fought fires in the Spanish-Harlem section of New York City. While others were running out of burning buildings, he was among those who put on a helmet to run in. Although he bravely faced some of the scariest parts of human vulnerability, as he watched the drama of life and death, grief and joy, it wasn’t the bravery of the heroes with whom he worked that impressed him most, but rather the courage of children who had never imagined they would have to be so brave. While attending the funeral of a firefighting comrade who had lost his battle with cancer, Tim watched his friend’s sons solemnly carry their dad’s fire helmet out of the church. Firefighters are expected to be brave, but children rarely consider their own courage. While Tim was personally challenged by the weight of grief he felt for the loss of his friend, he was inspired by the kids’ strength…a strength that emerged when it would have been appropriate for them to be weak. He saw a power in them they might not have even recognized in themselves. Tim was inspired so much by this observation, he felt compelled to pen a children’s story in tribute to his friend and the sons he left behind. The initial version of The Good Fire Helmet was written before the 9/11 tragedy in New York City. Tim wrote of two boys, Tommy and Christian, who struggle with the grief of losing their father, but who find the personal courage they need to grow through it. Tim had circulated some proposals for the manuscript but eventually he put it aside. It wasn’t quite time to share his story with the world. For a period in Tim’s life, the stuffed stories were the last thing on his mind. In the months leading up to the events of 9/11, the Hoppey family spent more time in New York City than they did at their home on Long Island. The Hoppey’s youngest son had relapsed with cancer, and he was fighting for his life. Then on September 11, 2001, Tim Hoppey’s world seemingly collapsed. When the towers fell on that fateful morning, Tim’s good friend Tom Dennis had been working on the 105th floor of the North Tower of the World Trade Center. Tim had only a moment to consider the fate of his friend before his engine company, Engine 91, was called to the tragic scene as a first responder. We all remember the photos of the exhausted and ash-covered firefighters: some sitting on curbs, holding their overwhelmed faces in their hands; others slowly walking, carrying the weight of a tragedy too big to hold. It was heart-breaking to catch sight of their tired eyes surveying the debris of the fallen buildings. It’s not the way we want to visualize our heroes. They are not supposed to be overcome. They are supposed to hold us up…to carry us away from danger…to be bigger and stronger than we are. They are meant to inspire the best parts of who we can be. Anyone can be strong when it’s easy…it’s the true heroes who find a way to be strong when it’s hard. Not much was easy about Tim Hoppey’s life at that point. He grieved with the rest of us for all that was lost that day, but especially for his friend, Tom Dennis, who was never found. “I lost friends and I thought I was losing my son,” he remembers of that time in his life. If ever there were a need to combat grief and fear, it would have been then. So, if you’re supposed to be the hero, what touchstone do you use to remember courage when grief and fear seem overwhelming? For Tim…he went back to the children. He found purpose in offering solace to the Dennis family as they grieved. It became important to him to be present for the Dennis’ two children, Lauren and Tommy, and he wanted to help remind them of their courage. The Hoppey and Dennis family did many things together, not the least of which was find the strength they needed to carry on. Tim was living out the message of the children’s story that still lay at the bottom of his desk drawer. He started to consider there might be power for other people who have gone through similar struggles. And truly, you don’t have to be a child to understand that either. Coming out of unimaginable challenges, Tim was finally ready to present his story. Although written years before, the story became more poignant than ever because Tim had tested its truths while living his own life. 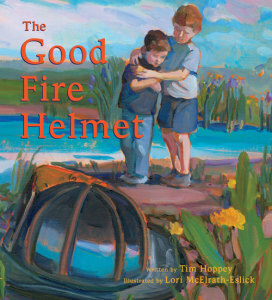 In a scene from The Good Fire Helmet, the boys remember what the chaplain says as he hands them their father’s helmet: This helmet has a good deal of courage in it. It’s been down dark, smoky hallways and done many great deeds. As you get older, there will be days when you will need to be brave. Perhaps you won’t believe you can do it. On those days, if you just touch your fingers to this fire helmet, its courage can be given to you. A good fire helmet has been known to do that. The Good Fire Helmet book has been known to do that, too. At the end of the story, when the boys have to make a choice between clinging to the helmet or acknowledging their own courage, they are brave enough to test their mettle. They become emboldened through their own courage and are able to push through grief and fear enough to find personal strength within. Tim’s real-life story parallels the journey of Tommy and Christian. It is both because of children and for children Tim has become inspired to take on his new career as a children’s writer. Tim wants to remind kids that although the world feels big and scary sometimes, they don’t need anything special to find courage. They already have the capacity for great things…to be the hero who chooses to wear a special helmet, or the one who steps up to be brave when everyone else’s feet seem planted. 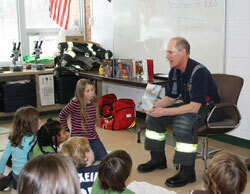 Tim reads to children during his school visits. “Books are one way to show children the way the world should be,” says Tim. He has worked to inspire children to see their individual potential well beyond the pages of his books. For several years, Tim has helped to coordinate an annual river-rafting trip for at-risk teens. Tim uses both stories and real-world experiences to encourage children and teens to celebrate the better parts of who they are. He offers a figurative courage-filled helmet to all of us. We all face grief and fear through our lives, and for the youngest who are presented with that challenge before they think they are ready, Tim wants to remind them of their greatness. If they believe, they will find the courage within to face anything that comes their way. Kids look to heroes for examples of courage, and Tim Hoppey is an inspirational hero who quickly turns a mirror for them to see the hero within themselves. 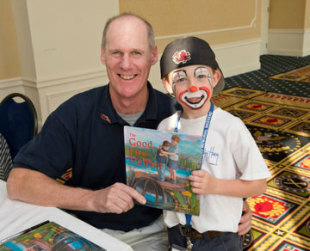 Feature photo: At The National Fallen Firefighters Foundation Memorial Weekend, Tim signed copies of The Good Fire Helmet for more than 50 children whose firefighter parent died. Books were donated through Elva Resa’s Hug-A-Hurting-Heart program. You may also be interested in reading about illustrator Lori McElrath-Eslick and her courageous journey through heart surgery while working to complete illustrations for The Good Fire Helmet.